How to Become a Pinterest Ninja - Hey Mommy! What is a Pinterest Ninja?! How I became a Pinterest Ninja and how you can too! This post may contain affiliate links. As a means of providing income for this website, I may receive commission for purchases made through links, at no extra cost to you. Please see the full disclosure for more details. If you want to increase your website traffic AND learn more about Pinterest, there are two things you need. Tailwind and Pinterest Ninja. Tailwind helped me to significantly increase my traffic, while reducing my Pinterest workload. Actually, I still have tons to do on Pinterest, but I can do MORE BECAUSE I know Tailwind is working at the same time. 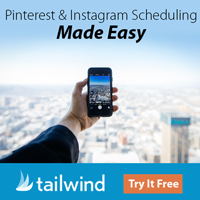 Tailwind is a scheduling tool for Pinterest, and now Instagram too! You can organize and shuffle your queue, and join “Tribes”, which are groups of bloggers, usually according to niche, designed to help provide quality content to re-pin, and have yours pinned as well. It’s like a step above Pinterest group boards – the point being to help each other. THEN, Tailwind provides in-depth analytics about your pins, your boards, including group boards (how awesome is that!? ), and your traffic. Tailwind also has a great knowledge base, full of helpful information about how to get the most out of Tailwind. Like this AMAZING article, The Ultimate Guide to Pinterest Analytics and How to Use Them. Also, be sure to check out this article by Tailwind, Typical Results of Tailwind for Pinterest Members. Tailwind provides this information so we can see the average growth of Pinterest and Instagram accounts after using Tailwind. Enter, Pinterest Ninja. The two go hand-in-hand really. Pinterest Ninja will help you to really understand Pinterest, Pinterest Analytics AND Tailwind Analytics. Analytics went a bit over my head at first. All the different things you can look at, which can help you and your website be the very best they can be! Tailwind helps you post at optimum times, based on it’s own analytics of your traffic and the traffic on the boards you belong to. Tailwind knows when people are active on a board, so it adds time slots to your “smart schedule” based on that information. With board analytics, you can see what boards are performing well for you and others that may not be. Anyway, back to Pinterest Ninja. I was absolutely blown away by the quality of this purchase. It is more than an ebook, it’s really more of a course. You can follow along and implement the strategies, watching your traffic grow as you do! Megan, the author of Pinterest Ninja, makes over 10k per month with her website, Love.Family.Health. So ya, I would say she knows a thing or two about driving traffic! Pinterest Ninja includes videos, to actually show you the concept being covered, for example, how to use the Pinterest and Tailwind analytics sections and tabs. I felt like I just kept getting bonuses, as I was going through it. Things like spreadsheets of Facebook groups and Pinterest group boards, organized by niche! What a gem! Even when I first downloaded it, I felt like I was getting value for the purchase. Most ebooks are somewhere between, what, 20-40 pages? When I first opened Pinterest Ninja, I was blown away when I realized it was over 100 pages! Pinterest Ninja really goes beyond just Pinterest. It contains valuable blogging tips from branding to affiliate marketing. Click over here now to grab your copy of Pinterest Ninja! You won’t be disappointed. Plus, there’s something so satisfying and cool about calling yourself a NINJA! Right?! One other thing, everyone loves Canva (and I do too! ), but lately I’ve been using Stencil for all of my pins and images. Stencil makes it super-duper easy to resize images and it comes with over 1 million beautiful stock photos. So I make a Pin, save it, then I resize for Facebook, save it, then resize for Instagram and send it right to my phone for posting to Insta – awesome!